Minestrone is a hearty Italian vegetable soup that can be stuffed with just about any veggies your heart desires! 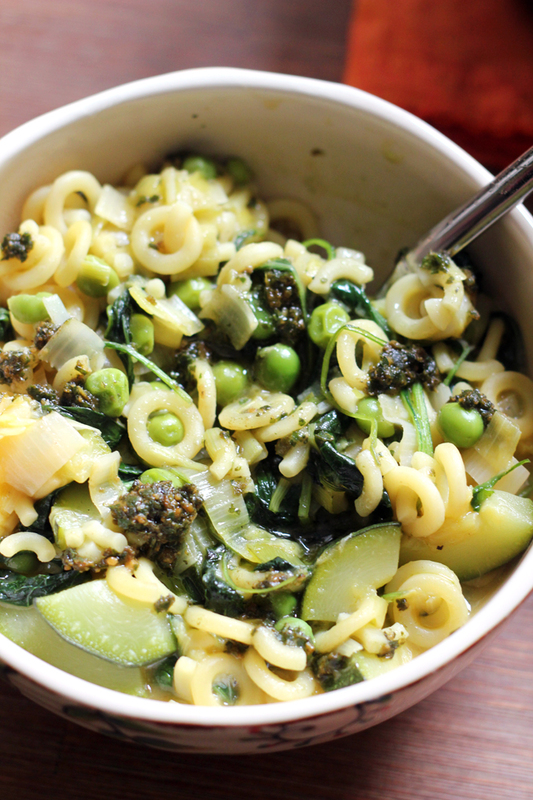 It goes green in this minestrone verde, which is filled with the bright flavors of leeks, zucchini, peas, kale, and basil pesto. Oh, you thought we were done with all the green now that fall is totally offish. 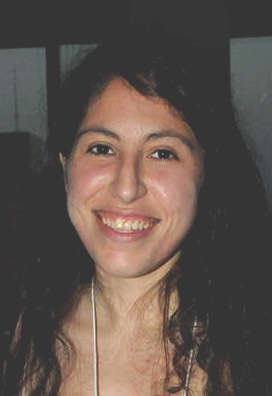 (ial). I mean, I pretty much see it as my life’s mission to shove ALL THE CHLOROPHYLL down ALL THE THROATS every day until forever. And especially while it is still 80 DEGREES where I live. If that’s not a green food-appropriate temperature, then I don’t know what is. I’m not sure that it’s a soup appropriate temperature, but it is fall by definition. Basically what I’m trying to say is – life is confusing. Soup is not. I’m willing to bet that even if you, personally, are not still growing zucchini at a rapidly alarming rate, you have a neighbor from whose garden you could pluck a summer squash or two without them noticing. Though very simple, this minestrone is full of great flavor that gets infused from all of the fresh green veggies that stew in it, some extra large handfuls of pecorino, and a healthy dollop of pesto. No slurping judgment unless you end up with kale in your teeth. Then all bets are off. In a large pot, heat the olive oil over medium heat. Add the leeks and salt to the pan and saute, stirring frequently, until tender and translucent, about 5 minutes. Stir the zucchini into the pot and season again with salt and black pepper. Saute until soft but not yet falling apart, stirring frequently, about 10 minutes. Pour the broth into the pot and bring to a boil. Stir in the pasta and return to a boil. Lower heat to a simmer and let cook for 1-2 minutes. Stir in the peas and kale. Continue to simmer until pasta is al dente. Remove from the heat and stir in the pecorino romano. Season to taste with salt and black pepper. Divide among serving bowls topped with dollops of the pesto. 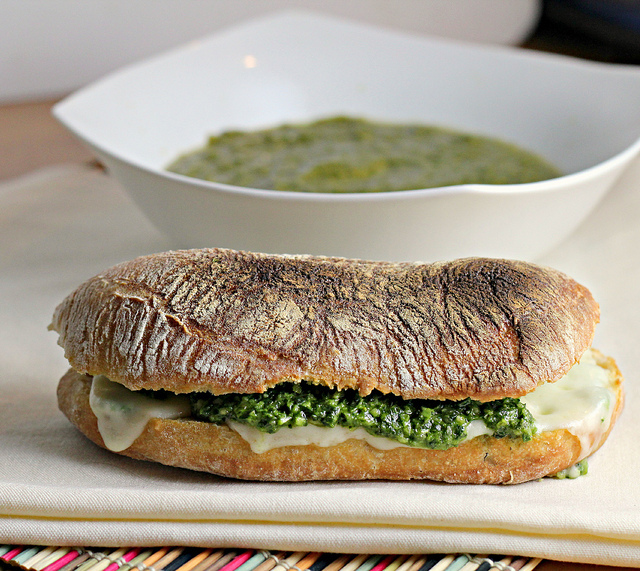 What a great idea to top it with basil pesto. The soup is really pretty and I bet it tastes amazing too! Oh yes please! This looks exactly like what I want to eat now! Soup! I haven’t thought to make soup yet this fall since it’s been fairly warm so far still…. Thanks for the reminder to make it though. This recipe looks fantastic. Love all the green veggies you snuck in there! Girl, I appreciate your love for green. It reminds me to get on the train!! Loving this minestrone! I think your new name is “The Green Queen” All your green recipes make me want to face plant into them PRONTO! Plus, it’s all cold where I live now, so I need this. Pinned! It’s probably not breaking and entering to sneak into a garden, right? No breaking required. Just sweet, sweet zucchini rewards. 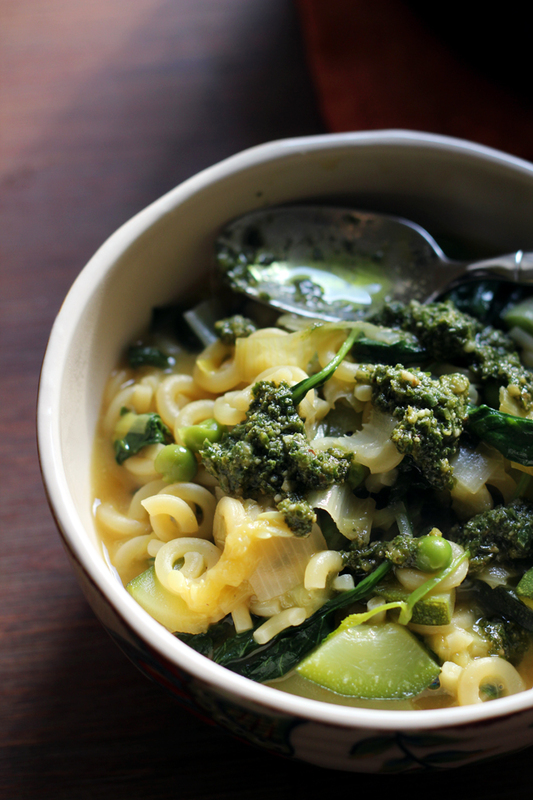 I love pesto in soups and basically all of the green things. So basically, I need this in my life. For breakfast? Okay. My jaw dropped when I saw your photos. I need this for breakfast and that is not a joke. 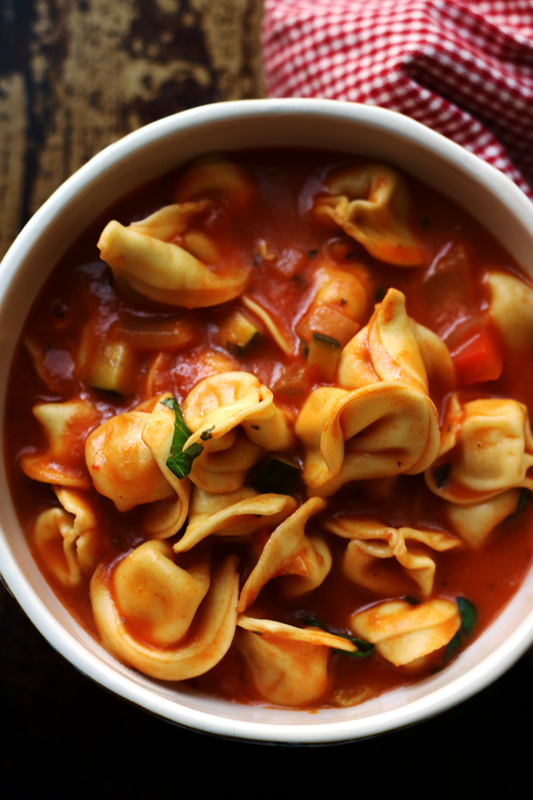 This is my favorite minestrone recipe I’ve seen! Totally pinning. You had me at kale and pesto! First I thought it was a pasta dish but it’s soup! Even better. Love chunky, thick soups . Yum! I am going to top my minestrone with pesto next time! Such an excellent idea! Joanne – this is such a BRILLIANT twist on a classic!!! 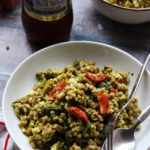 I have only eva had tomato based minestrone – this green version is just BRILLIANT! And Enticing!!! I think it looks beautiful and delicious! Ok, I’m with you…I’ll hold their mouths open while you shove down the chlorophyll. 😉 Love this soup!!! I love soups where one can really play around with ingredients. This one fits the bi to the T.
Green is good year round. That pasta is adorable (to be honest, it’s reminding me of Spaghetti-Os! ), and the soup sounds wonderful. 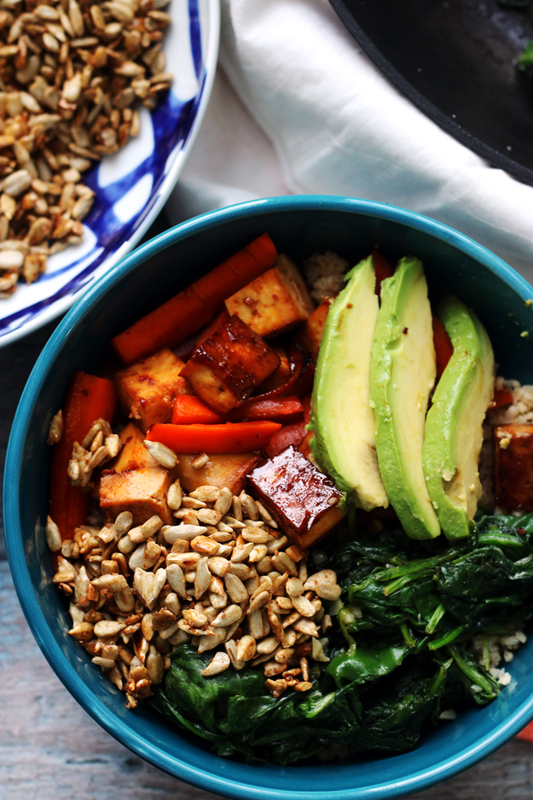 Love all the green veggie-ness in there! I think it’s 80 degrees everywhere today, but regardless of the temperature, I cannot give up the green stuff… even if I have to endure mockery when it ends up in my teeth. Also, your readers may gladly come steal my zucchini. I have no fence, so it’s not technically B&E, right? So slurptastic! I love those bebe noodles in this. I am putting this on my to make list!! 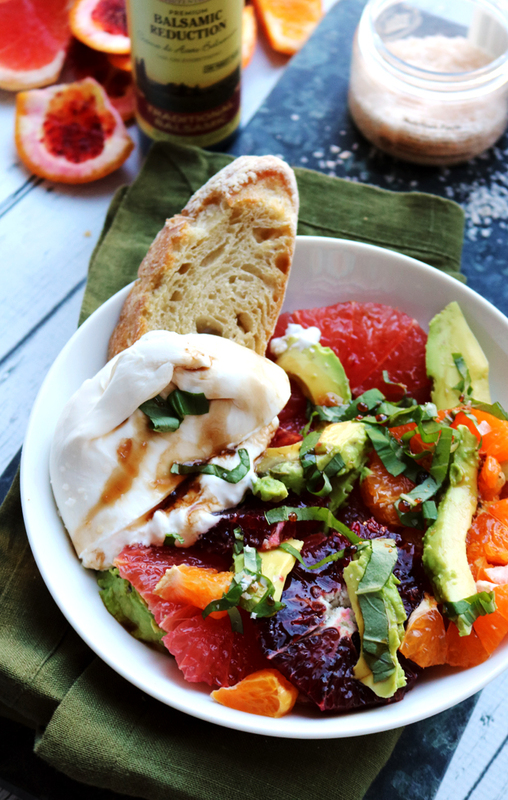 I’m posting a salad app tomorrow – I refuse to let Mother Nature put my taste buds in a box. Bring on the greens! Hi Joanne, this could be my favorite new soup, love all the veggies and the way it looks! This is legit the best minestrone I have ever seen IN MY LIFE. I could slurp this soup up no questions asked. 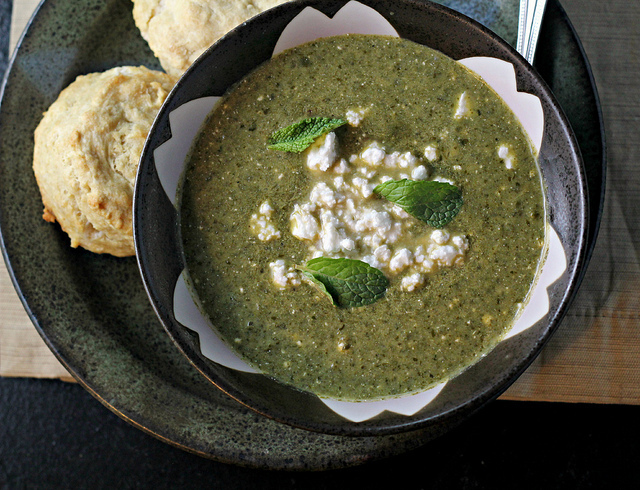 It’s just beginning to get a little colder here and this soup would be perfect. all this green is as pretty as it gets! love it! 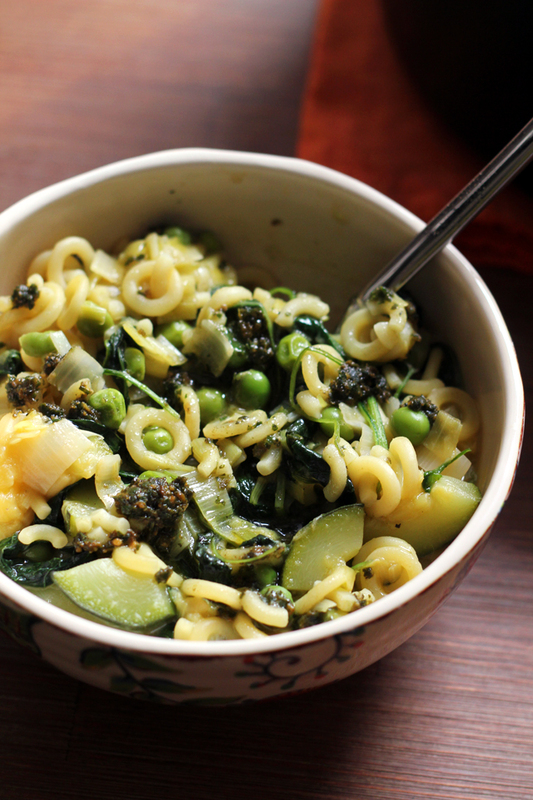 I love this green minestrone, especially as there’s no tomato in it (a bit allergic). Thanks for the great idea and scrumptious pics. oooh this soup sounds delightful! I can totally get behind your life mission, esp if it involves this soup! I could pretty much live on this soup for a week or so! I love that it’s super comforting and super healthy all at the same time. Pesto in soup. Yes, yes, yes! 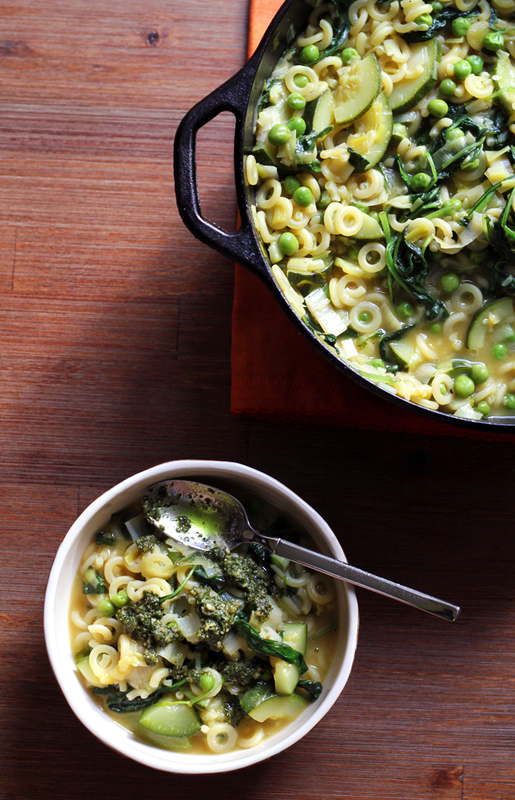 Minestrone is totally my fav soup on the planet—So I say BRING ON the green version! What a great use of greens! I can always find some hiding in the bottom of my crisper drawer and I’ll keep this in mind. A good soup has its value regardless of the temperature! Great minestrone! 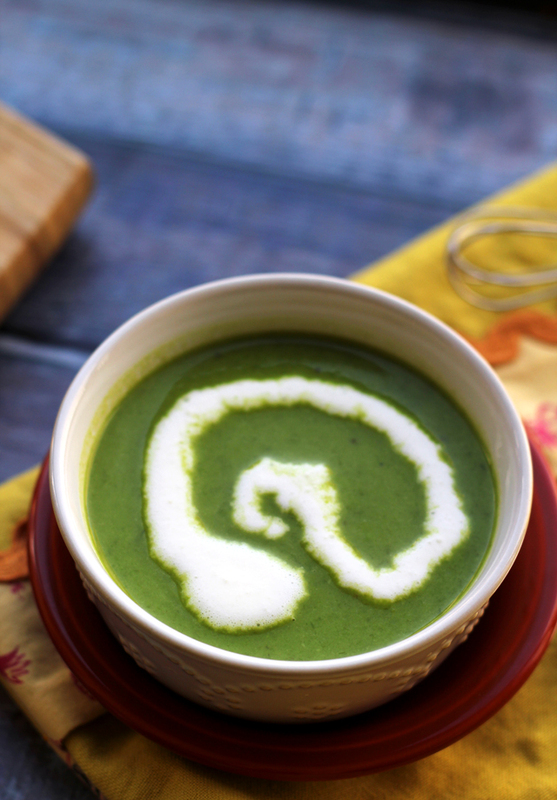 Heck yes – this soup look amazing! I have no problem with seeing green food – the greener the better in my opinion 🙂 Love this! Dude, love this soup!! 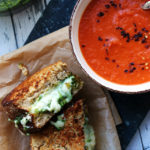 basil pesto in the soup? brilliant!!! Utterly perfect. 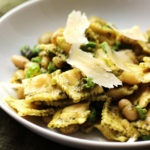 Pasta, greens, pesto- 3 of the best things! 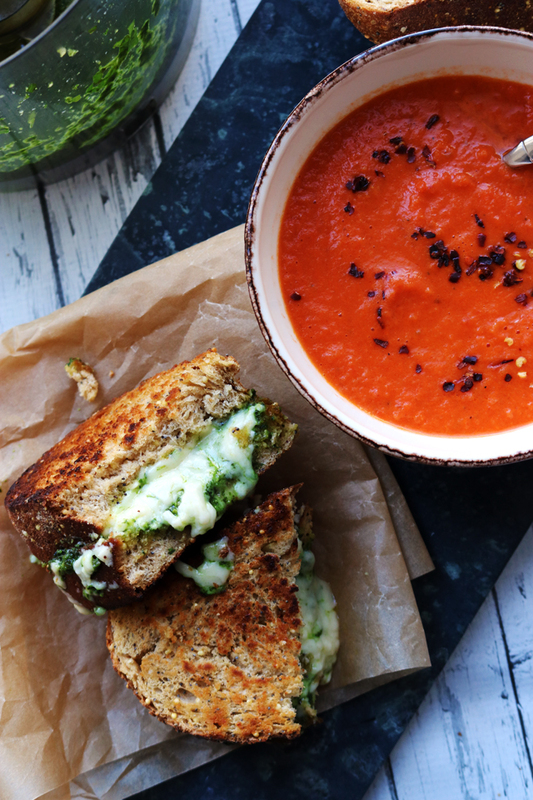 I get a little tired of tomato-based soups sometimes so this is certainly a welcome change. I am a big advocate for greens ALL YEAR long. Why stop now? This looks great. Thanks for sharing. This looks amazing! 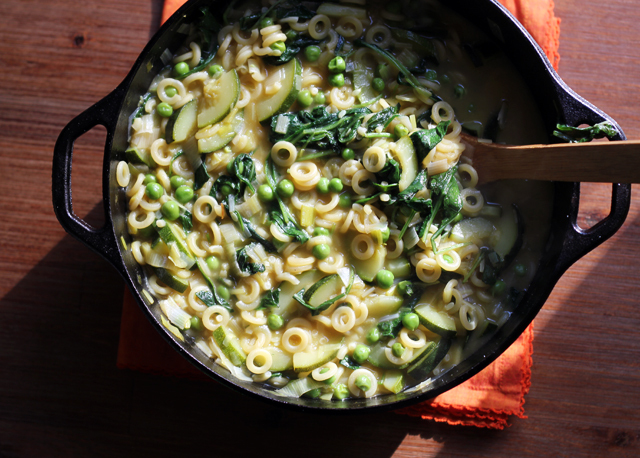 I love the green spin on a traditional minestrone. Definitely will have to make this! 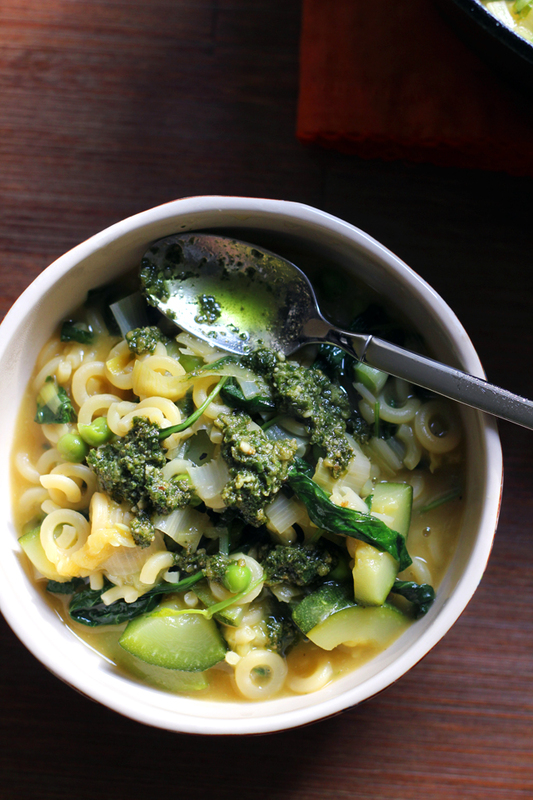 I love all the green that you put in this minestrone. Perfect for the cooler weather. oh wow I love the zucchini in it! Totally awesome! Yum! This soup looks delicious! 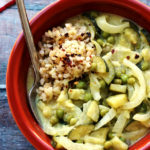 We shared it in a blog here: http://wedigfood.com/foodie-blog/10-delicious-vegan-soups-for-fall. We are building a community of vegans and would love for you to hop over and leave a recipe.